Add a comfortable place to sit plus a beautiful accent piece to your home bar or counter space with this Rustic Red Cedar Bar Stool with Swivel. Handcrafted from our Amish woodworkers from red cedar logs that are hand picked to represent the beauty of nature in your home. The convenient swivel seat allows for easy access and maneuverability, while the sturdy backrest provides plenty of support and comfort for a relaxing drink with friends after a long day. 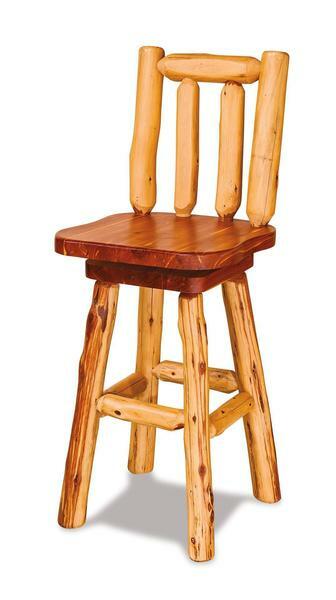 Contact our friendly furniture specialists for additional information on the stunning rustic red cedar log bar stool. Bar is not included in the price.